CREATINE SUPPORTS A VARIETY OF HEALTH AND FITNESS GOALS! You don’t have to be a body builder or competitive athlete to benefit from supplementing with creatine. While Creatine Monohydrate is used primarily by athletes training for explosive type competitions, it can be useful as a supplement for general health as well. Energy production and more... We have explained how creatine phosphate combines with ATP in our body to produce energy. There are a number of health issues where supplementing with creatine may assist with with your recovery. It’s also showing promise in preventing some diseases you may be genetically pre-disposed for such as high cholesterol and neuromuscular afflictions. Gain Weight – Energy and hydration for your muscle tissue Being energized during your workout directly translates to more muscle mass as you will be able to train harder and longer. 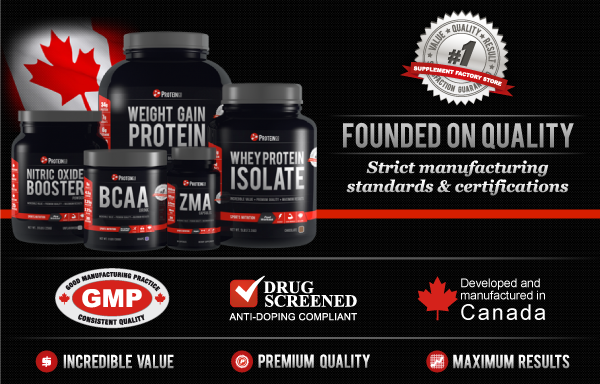 Creatine supplements Canada are a must for this purpose. Creatine not only assists with muscle development through effective training, it can help increase the size and mass of all your body’s muscles by maintaining proper hydration in your muscle tissue. Water gets attracted to the creatine phosphate in your muscle cells making them bigger and fuller. This has the added benefit of keeping your body in a state of muscle building, according to some recent studies. Speed – Explosive strength from fast twitch muscle fibers Increases in muscle mass and size are directly related to increased strength and speed. Since ATP-CP is your “explosive” energy system, it stands to reason you will be targeting the explosive, fast twitch muscle fibers by improving this system. Energy – ATP is a rapidly depleted energy source. Creatine is the key to more production Creatine is directly related to adenosine triphosphate, forming the ATP-CP energy system. ATP is formed mitochondria, the power plant for energy your body. ATP has been referred to as the "universal energy molecule" used by every cell in our bodies. Improving the body’s ability to generate and use ATP for instant energy when you need it comes from supplementing with our Creatine Monohydrate. Active Lifestyle – Creatine has a long list of benefits for overall health Increasing oxidative stress, along with the cell's inability to produce essential energy molecules such as ATP, is a marker aging cells found in many disease states. Research indicates keeping high ATP levels are essential in fighting the aging process. Of all the nutritional supplements, creatine appears to be the most effective for maintaining or raising ATP levels in the body. Other research has shown that creatine may have a wide variety of uses. In fact, creatine is being studied as a supplement that may help with diseases affecting the neuromuscular system, such as muscular dystrophy (MD). Recent studies suggest creatine has possible therapeutic applications in aging populations for wasting syndromes, muscle atrophy, fatigue, gyrate atrophy, Parkinson's disease, and Huntington's disease. Several studies have shown creatine can reduce cholesterol by as much as 15%. Some studies have found that creatine may also increase growth hormone production, which is crucial for being able to active at an older age. Creatine is formed in the body from the amino acids methionine, glycine and arginine. An average size person has approximately 120 grams of creatine stored as creatine phosphate. Certain foods contain a fairly high amount of creatine. However, a person would have to eat pounds of these foods every day to get the amount of creatine in a single teaspoon of ProteinCo’s Creatine Monohydrate. When supplementing with creatine, about three grams per day is adequate for healthy people to increase the levels of creatine phosphate in their body. Athletes who train or compete daily, as well as others with a deficiency, may benefit from a higher dose of 5 – 10 grams per day. Creatine, glycine and arginine are active ingredients in our Amino Recovery. This makes it an excellent choice for adding more ProteinCo Canada Creatine Monohydrate to personalize it for your specific training goals. CREATINE MONOHYDRATE FOR BUILDING MUSLCE MASS! Creatine converts ADP back to ATP - All you really need to know is creatine works to help generate energy. Adenosine triphosphate (ATP) is the main energy system your body uses at the cellular level. This is the primary energy source used for short, powerful movements like a golf swing, a 100 m sprint or weight lifting. Creatine phosphate combines with ATP to become what is commonly referred to as the ATP-CP energy system. When ATP is broken down, it loses a phosphate molecule becoming ADP. Creatine combines with ADP to add that molecule back, regenerating ATP. ATP is continuously regenerated in your body. On average, at any one time, you only have 250 grams (about 9 ozs) of ATP readily available to use for energy. It’s depleted rapidly but also regenerated quickly. You manufacture your own body weight in ATP each day. Creatine is stored in the human body as creatine phosphate (CP) also called phosphocreatine. Increasing your stores of CP equates to faster and greater recharging of ATP, which means more work can be performed. Therefore, creatine is a must have supplement for short-duration explosive sports, such as sprinting, weight lifting and other anaerobic efforts. Creatine supplementation can increase the amount of creatine phosphate in muscle tissue Your goal is to build up the amount of creatine phosphate available in your muscle tissues. Being successful, you will most likely have increased energy production capabilities, translating to longer, harder and more effective workouts. Research indicates supplementing with creatine can increase the total body stores of CP, which means greater generation of energy for anaerobic exercise like weight training and sprinting. Loading can peak creatine levels in your muscles When creatine is taken orally, it is absorbed by the intestines and then enters your bloodstream. Studies have shown that short loading cycles supplementing with 15 to 25 grams of creatine for five days elevates the total creatine content in the muscles by 15-30% and the phosphocreatine stores by 10-40%. After a loading phase of five days, a maintenance does of 2-5 g is enough to maintain elevated creatine levels. Without utilizing a maintenance dose, creatine levels will most likely return to their original state after about a month. Another loading option, where comparable results can be achieved, is by consuming a lower dose of 3-5 grams during a 4 week on, and a one week off cycle. More isn’t always better Concentrations of creatine in muscles have an upper limit that cannot be exceeded. Ongoing supplementation with large amounts of creatine (15 grams or more) does not raise the levels of creatine in muscle, so is not recommended. High loading dose cycles are only suggested for short periods of time before you should cycle off for a week or two. Sometime in the 4 weeks leading up to a competition may be the ideal time to utilize a loading cycle with ProteinCo’s Creatine Monohydrate. Q – Can I use Creatine Monohydrate continuously? A – Low doses of 2-3 grams per day could be used on a daily basis with no ill effects most likely. A dose of 3-5 grams every day for a month then cycled off for a week before resuming is a more widely accepted routine, and our personal recommendation however. Q – What is the best time to use creatine? A – Several hours before a workout is the ideal time to supplementing with Creatine Monohydrate. This will assure you have as much available as possible to keep your energy levels and regeneration at their peak. It’s also a great recovery supplement and can be added to our BCAA Powdered Drink and sipped during training. BUILD MORE MUSCLE AND GENERATE MORE ENERGY! Q – Can I add it to other products like your Amino Recovery? A – Yes. Our Amino Recovery is an excellent product for personalizing with added creatine. There is already a bit of Creatine Monohydrate in our nitrogen balance preserving blend and adding 2-5 grams additional may be of additional benefit for your recovery. It also lends itself well to adding to any of our other powdered drink mixes. Safety Not recommended for anyone under 18, women who are pregnant or nursing, diabetics, kidney patients, those with fish allergies, or anyone taking prescription medications. Ingredient: Creatine Monohydrate by ProteinCo Contains 100% Pharmaceutical Grade Creatine. Pharmaceutical Grade Creatine used in the ProteinCo brand is the purest, most potent form of creatine monohydrate you can find anywhere. Incredible Value - Buy direct from the factory and FREE Shipping in Canada! The ProteinCo’s commitment to you is in providing the highest quality product at the best possible price. One of the primary ways we accomplish this is by bringing the product directly to you rather than using retail outlets where the middleman drives up the price. Every order of $49 qualifies for FREE shipping which adds even more value. Maximum Results - Fat Loss, Lean Muscle Gains and more.. ProteinCo’s Whey Protein Isolate is also a great supplement that will help you lose excess fat while avoiding the reduction of your muscle size. Mixed with water it’s a healthy protein shake decreasing the amount of calories in your daily diet, as well as providing suitable protein concentrations for your body with no carbohydrates and fat. Conversely, mixing a serving with other foods, juices and nutrients such as our Glutamine 500 and BCAA500, you can personalize a recovery drink, snack or meal replacement. When you use ProteinCo's Whey Protein Isolate powder as a high protein shake to replace meals, it provides the perfect source of proteins to assist active people in burning fat and building lean muscle mass resulting in improved fitness and overall health. Mixing Mix just prior to consuming as creatine stability is lost when it is pre-mixed. Always mix with caffeine-free beverages such as water, fruit juice or warm decaffeinated or herbal tea (which improves solubility). Hydration With creatine in particular, it’s important to stay properly hydrated. Additionally, when you mix creatine, use the guideline of 100mL of water for every 1 gram of creatine. Daily Dosage A daily dose of 3-5 grams is recommended for no more than 4 weeks at a time. Cycle off for one week before continuing. Another option is to use a higher dose of 15-25 grams for a 5 day cycle, then maintaining with 2-5 grams which may increase your body’s available creatine stores. Personalizing Add to our Amino Recovery, Whey Protein Isolate, BCAA Powdered Drink, Waxy Maize or any other powdered product of ours as desired to meet specific needs and training goals. Pre Workout Taken several hours prior to a workout can turbo charge your energy stores available during your training session. Remember, it’s best to consume with caffeine free beverages and should only be mixed just prior to consumption. Post Workout Mixed with our Amino Recovery or BCAA Powdered Drink, could provide additional recovery benefits. Recharging your creatine stores immediately following exercise fuels the systems right after you have depleted them. It’s arguably an important window for replenishing all the nutrients your body needs for continued hard training.